Two positive and negative connection terminals for easier wiring. These solid-state converter/chargers deliver filtered DC power to all RV 12 Volt lighting and appliance circuits providing safe and reliable service. 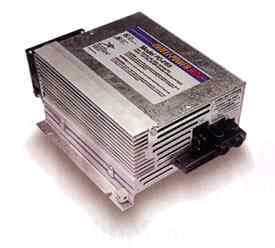 High voltage protection protests Converter form spikes or surge of voltage over 135V. Dimensions 4.5" x 7 x 7.25" 4.5" x 8.625 x 7.25" 4.5" x 8.625 x 7.25" 3.6" x 8" x 9.0" 3.6" x 11.5 x 9.0"
Weight 4 lbs. 4.5 lbs. 4.5 lbs. 5.8 lbs. 7.5 lbs.